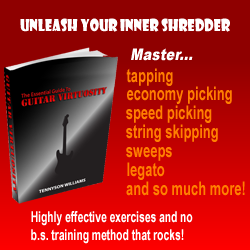 Last year voted as ”number one shredder of all time” in April 2003’s issue of Guitar World magazine, this ”breaking the boundaries” guitarist has certainly influenced a lot of shredders the belief that nothing is impossible if you put your mind to it. Over his career he has played with the band ”Nitro”, made 4 outstanding records of his own, and also released the mega-seller DVD ”Speed-Kills” which Angelo shows you step by step on how to perform his classic shred masterpiece ”No Boundaries”. His classic ”synth” esque tone is helped by his signature Dean guitar followed through a Marshall Valve head and cab (not Randall for those of you who thought it was on No Boundaries, it was just as a promotion!). Michael practically has perfected every ”Shred Metal” technique known to man, which includes immaculately accurate speed/alternate picking at breakneck speed, sweep picking/Arpeggio picking, cross-string tapping and many more. Michael has always wanted to be different than other guitarists, that’s why we at shredaholic respect him for being an individual and ”not following trends” type of player. 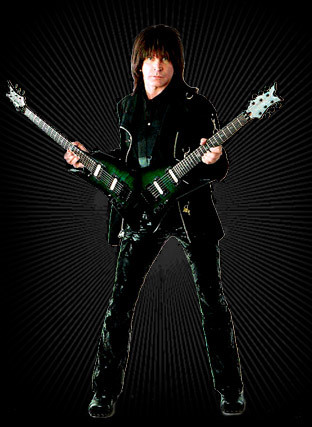 He took it to the extreme when he announced his signature ” Double-Guitar designed by Dean Zelinsky called the “The Dean Mach 7- Jet Double” In October 2003. Michael has proven to the world that he can play both guitars at once with tremendous ease. Michael has vast music knowledge and started playing piano and composing at the age 5 and started playing guitar at age 10. At 14 he was playing jazz music and at 16 years old he won an award for outstanding jazz musician (what an achievement!). He’s toured the world travelling to over 35 different countries since 1993 and has performed over 1200 shows since then. He also took Joe Satriani’s genius invention of the ”Sock-Dampener” and invented his own ”String-Dampeners” himself (obviously without a sock!). He started out as a session guitarist at 19 years old doing music for Films, TV, Radio… you name it he’s done it! Although, Angelo can play at breakneck speed, he can create the most immaculate melodies you will ever hear, it is in a sense music that Shredaholic describes as ”it gets you there”. We at Shredaholic salute Michael Angelo. eu gostaria da saber o nome de um filme que tem michael angelo um filme que passava na antiga tv manchete o nome era colapso mortal em portugues!!! !